Dubai Council for Marine & Maritime Industries (DCMMI) has partnered with Hellenic Marine Environment Protection Association (Helmepa) to establish a first-of-its-kind marine environment protection association in the UAE. 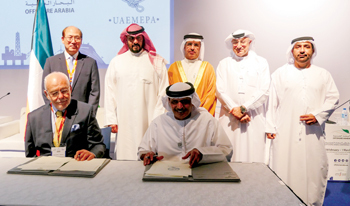 The new UAE Marine Environment Protection Association (UAEMEPA) is aimed at cultivating and promoting an environmental consciousness within the maritime community. UAEMEPA offers the opportunity, for all those who care for the environment and are interested in safeguarding it, to learn about the significance of the “marine environment” for our economic prosperity, social well-being and quality of life, remarked Khamis Juma Buamim, the chairman of DCMMI and chairman of Offshore Arabia 2018 after inking the deal with Captain Dimitris C Mitsatsos, the secretary of the International Marine Environment Protection Association during the Offshore Arabia Conference and Exhibition 2018. The marine environment is by nature a transboundary issue and it has to be managed through cooperation and according to integrated principles, stated Buamim. “Therefore, we aim to achieve “good environmental status” through creating, promoting and spreading safety awareness and security spirit within the maritime community,” he added. All members of UAEMEPA are ship-owning companies of ocean-going vessels, land-based entities dealing with the protection of the environment and concerned individuals, mainly seafarers.